Millions of parents take their children out every year to enjoy the fun of playing in the water. 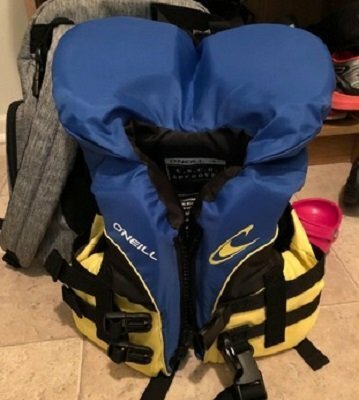 You are out boating with friends and put life jackets on your older kids, but you are planning on holding your baby so he doesn’t need an infant life jacket, right? No!! 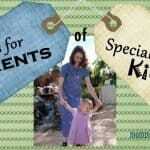 Most parents would agree that one of their main concerns is for the safety of their children. No well-meaning parent would ever knowingly put their child in danger. However, drowning is the number one cause of injury-related deaths in children. Thankfully there are life jackets to protect infants and children and reduce the number of tragic drownings. According to the CDC, the use of life jackets could potentially eliminate half the drowning deaths associated with boating. A life jacket (AKA life vest) is a personal flotation device designed for saving lives in the water. It is not meant as a swimming aid. So, if you’re looking for a toddler or young child go there. A life jacket is meant to hold the head up out of the water. A good jacket will cause the wearer to turn onto his or her back to keep the face out of the water. However, a life vest does not eliminate the need for adult supervision! 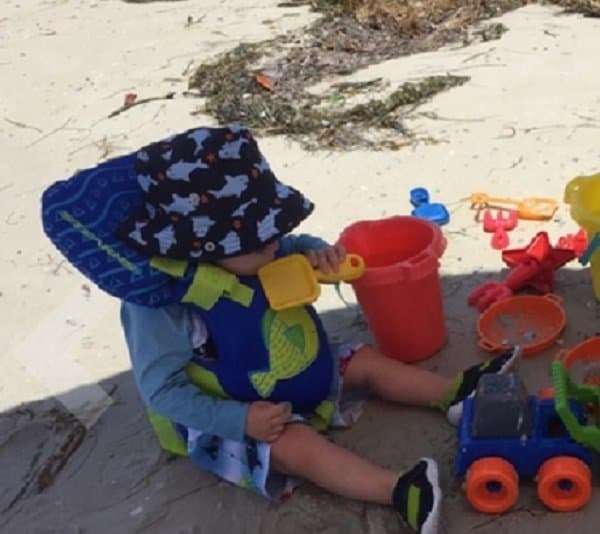 Always stay within arms’ reach of your child when they are in or near the water. US Coast Guard Approval. The US Coast Guard tests different flotation devices and determines whether or not they are capable of saving a life in the water. They Coast Guard assigns a rating depending on the buoyancy of the life vest. For infants and children, it is recommended to have a rating of Type II, which means there is an inherent buoyancy of 7 pounds. Type II is for use when sailing, fishing, or boating. It is not intended for use in rough waters. There is a rating of Type I which is more buoyant than Type II, but Type I is usually only for adult life preservers. For more information on Coast Guard Approval, visit the US Coast Guard. Type III is for recreational activities including swimming but not boating. These include swimming aids for children. Fit. A life jacket should be able to support the weight of the person wearing it. Check the tag in the jacket to make sure the wearer is within the recommended weight restrictions. Also, the life vest needs to be secured onto the wearer. All straps should be securely tightened. For infants and young children, a strap between the legs is important because it keeps the vest from floating up and over the head. Material. Look for high-quality foam and a soft covering that will not irritate the skin. Also, make sure buckles, straps, and zippers are not going to rub the baby’s skin or cause discomfort. Also, if your child is sensitive or allergic to any material, make sure it is not found in the life jacket you select. With something as important as your baby’s safety in the water, you don’t want to buy just any infant life jacket and hope it is capable of keeping your baby safe. We have done the hard work so you don’t have to. 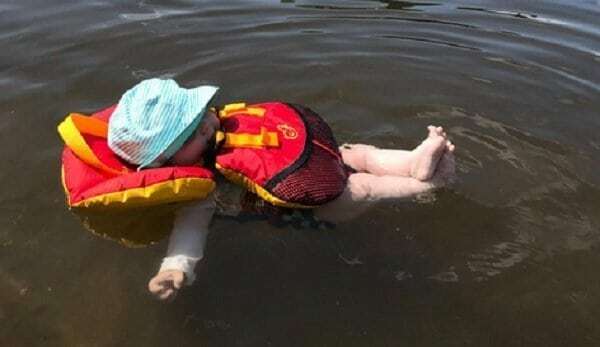 Here are the 10 best infant life jackets. 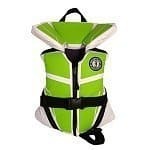 This life vest is approved by the US Coast Guard for infants 8-30 pounds (type II rating). 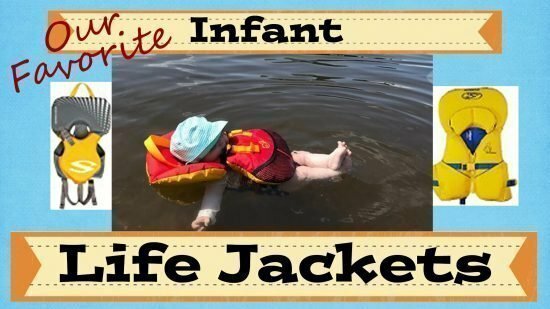 It is one of the only life jackets approved by the Coast Guard for newborns. The double collar provides extra support for the baby’s head. Attached to the collar is a grab strap, as another safety measure. The Stohlquist Life Vest provides a comfortable fit around the neck and an adjustable crotch harness. A zipper keeps the vest secured, and a quick release buckle is adjustable to give just the right fit. One of the most notable things about this option is that it only allows for back flotation (it causes the baby to turn onto his back). As a mom, this is a huge selling point. The nylon outer shell is not irritating to the skin. It comes in three bright colors. 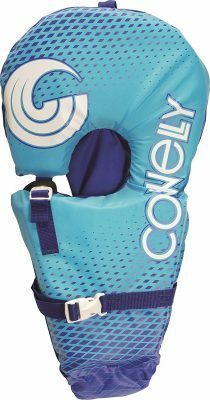 If you are looking for a good toddler life jacket that won’t cause your baby to sweat, this is an excellent option. Unlike most other life vests, the Mustang Survival Lil’ Legends 100 has a cooling panel in the back as well as mesh to provide ventilation. 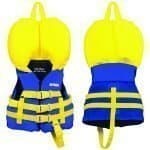 If your child will be in his life vest for an extended period, this is definitely a consideration. This is one of my favorite options on this list. It is made of very high quality materials. The shaped head pillow makes it easier for little ones to relax comfortably. While providing excellent buoyancy, the Mustang also allows for good mobility. This US Coast Guard-approved device is good for kids up to 30 pounds. The zipper, chest buckle, and center strap help keep your child well secured. 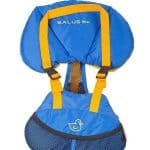 The winner of the Canadian Safe Boating Award, the Salus Bijoux Baby Vest is for babies 9-25 pounds. It has a 3-piece collar that supports the baby’s head safely. Unlike other similar products, the Bijoux vest has mesh that goes around the baby’s body, which secures the flotation device and is more comfortable than a regular crotch strap. This vest allows for more movement by the baby, unlike other products that are restrictive. It is very easy to put on and take off. Unlike other life jackets, this one doesn’t have a zipper but still keeps the baby securely instead. Note: This vest is not US Coast Guard approved. The Coast Guard only approves life vests that have a capacity of 30 pounds and this one only rates to 25 pounds. We still highly recommend the Salus Bijoux for non-boating use only. The O’Neill Infant Superlite USCG Life Vest is another great option for infants and toddlers. It is a type II US Coast Guard-approved device. While the manufacturer recommends this vest for 0-30 pounds, we find it is too big for newborns and is better for kids 15-30 pounds. This vest is excellent quality, as you would expect from the O’Neill brand. It is made of polyethylene foam and the shell is polyester, which will not cause chaffing. The zipper is heavy duty, and the quick-release buckles are sturdy but easy to open and close (for adults, not the kid wearing the jacket). A pull handle on the top makes it easy to pull your child out of the water if needed. You will find this vest is supportive of little necks. It also keeps little heads and faces out of the water, which is a great comfort to parents. This is another infant life jacket approved by the US Coast Guard for infants 15-30 pounds (type II). One nice feature is that it has a zipper on the back instead of the front so the baby’s neck and chin don’t get irritated. It also has buckles on the shoulders. The two adjustable leg straps and front strap ensure a proper fit and keep it from riding up. The large head support on this life jacket keeps the baby floating on his back and with his face out of the water. Attached to the head support is a rescue handle. 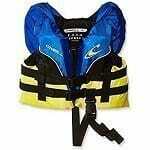 The Infant Hydro PFD is made with high-quality flotation foam and a soft Hydroprene cover. The bright color makes it easy to see your child if he does end up in the water. 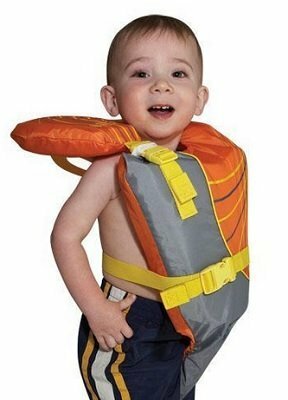 This is your basic, classic life jacket for infants and toddlers. A type II device approved by the US Coast Guard for kids 15-30 pounds, it is made of buoyant polyethylene foam and has a nylon cover. 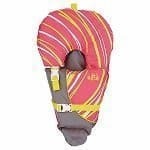 This infant life jacket has a zipper as well as adjustable straps around the waist and between the legs. Like with the other options on this list, the Stearns Infant Classic Series Vest is good at keeping kids floating on their backs rather than being tipped into the water face first. If you are looking for a basic jacket at a low price, this might be the right option for you. 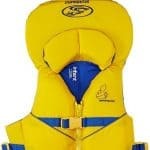 The Airhead Classic Infant Life Vest is for infants under 30 pounds. It is made of buoyant foam covered in a UV resistant polyester shell. Three straps with buckles go around the waist, and a strap fastens between the legs to keep the vest in place. Attached to the headrest is a grab strap, which allows you to pull the baby out of the water easily if needed. The Airhead Classic comes in several different colors and designs. It is approved by the US Coast Guard as a type II buoyancy rating. We do not recommend this for younger and smaller infants under 15 pounds. The O’Brien Infant Neoprene Life Vest is a US Coast Guard approved type II vest for infants and toddlers up to 30 pounds. We found that is best for kids over 15 pounds. The inside of this vest is high quality foam, and it is covered with BioLite, a good quality breathable neoprene that won’t cause irritation to a baby’s sensitive skin. It is less bulky than some of the other options on this list and doesn’t seem to ride up when worn. 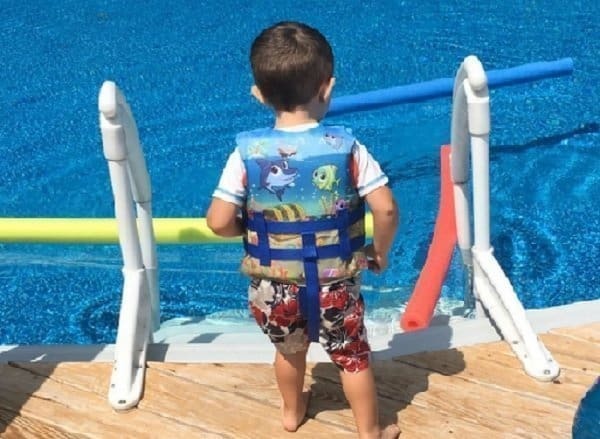 This life jacket for toddlers has a zipper closure as well as two straps secured by buckles, one strap around the waist and one strap between the legs. These straps and buckles help ensure a good fit which will keep your child safe. 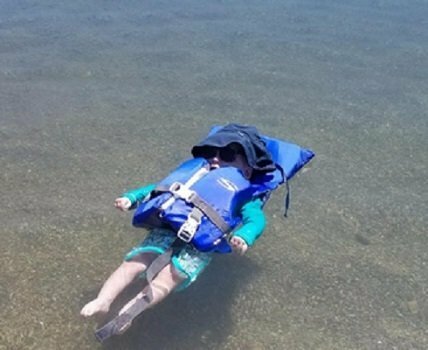 Another safety feature of this baby life vest is that it turns kids on their backs, which keeps their heads out of the water. 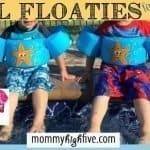 Overall, this is a good option for infants and toddlers 15-30 pounds. The Full Throttle Infant Vest is a US Coast Guard-approved type II flotation device for infants and toddlers up to 30 pounds. It is made of foam covered in nylon fabric. The oversized collar provides extra buoyancy, but it does make this vest bulky. It is good for infants, but for busy toddlers, this vest restricts movement (which my toddlers sure don’t like). This vest is different from others. It has a buckle at the shoulder and one around the waist. Elastic straps go around the legs. The Full Throttle Infant Vest is easy to put on and take off. Overall, this is a pretty good vest and is the least expensive on the list. This option, like the others on this list, is a type II baby flotation device approved by the US Coast Guard. The style of this vest is like the style of the Full Throttle. It has 2 quick-release buckles and elastic around the legs. 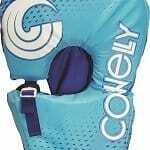 The Connelly is pretty restrictive of movement, which most kids don’t like. The flotation of this product is good. It is best for infants and toddlers who weigh 15-30 pounds. If your child is skinny, this probably isn’t the best option. 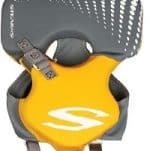 This baby life vest does tend to ride up and can cause chafing. Always supervise children around water. It takes only a few short minutes and a small amount of water for a child to drown. 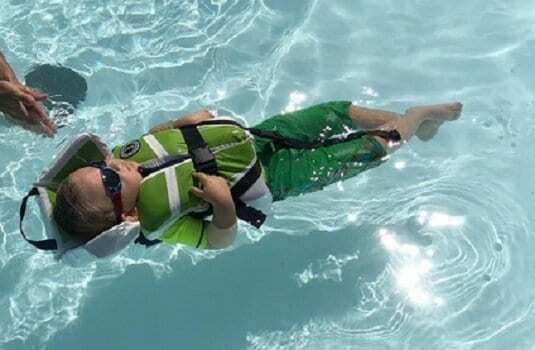 Young children should always wear a life vest or swimming aid in the water. 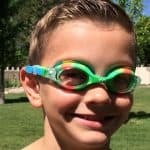 Until a child has proven to be an excellent independent swimmer, he or she should always be protected in the water. Learn CPR. Do yourself a huge favor and become certified in CPR or become re-certified if you have already received training. You never know when you might need to use this life-saving skill. Learn how to swim yourself. As an adult, you need to know how to swim confidently yourself so you can help (or even save) your child if needed. Always heed posted warnings and weather alerts. 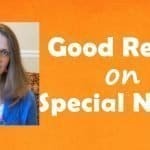 You don’t want to get caught in a scary situation so do your homework and you can avoid unwanted problems. Never go swimming alone. This applies to adults as well as children. Teach your children always to use the buddy system when swimming. As a mom, you want to protect your children from every possible danger. Enjoy the fun of the water without the worry by choosing a good life vest and following water safety rules. 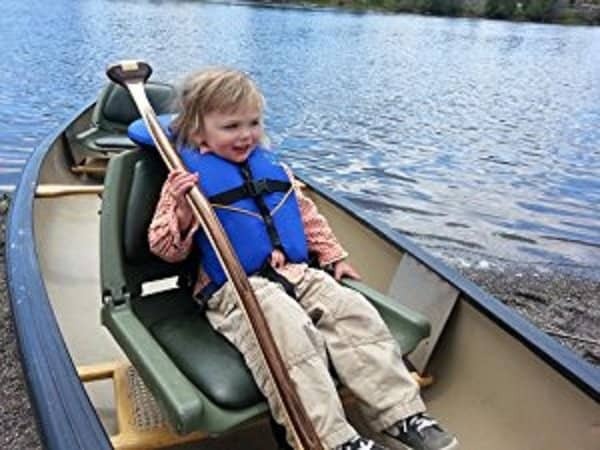 Although all of the options on this list are good, we most highly recommend the Stohlquist Toddler Life Vest for Infants and the Mustang Survival Lil’ Legends 100 Flotation Vest. 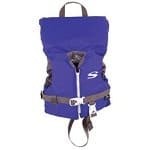 If you are not boating, we also recommend Salus Bijoux Baby Vest. Although the Bijoux is not approved by the US Coast Guard, we feel it has proven itself and is an excellent option which will keep your baby safe in and around the water. When boating in US waters, if you use a flotation device that is not approved by the US Coast Guard, you can be ticketed. For more information on water safety visit the Red Cross Water Safety Page. For more information on how to choose a life jacket you can visit the USCG.